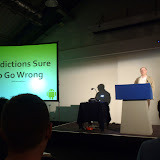 I am at DroidCon UK at the moment, and it has been an absolutely fantastic first day! Today was organized as a barcamp. I have to say: All the speakers I heard today were really good and the topics were interesting. Some of the slide decks contained too much text (IMHO), but the talks were interesting and engaging anyway. I also met a lot of nice people, and chatting with them in the breaks was great fun. Socializing and networking was really easy - I had the feeling that everybody wanted to meet new people and nobody minded being approached by a stranger. This is definitely one of the best conferences I have attended so far!